Transportation in Japan is known for generally being on time, clean and smooth. The highways are no exception to this and if you choose to drive in Japan you will find the highways are fun to travel on. You might want to avoid the traffic jams that can stretch over 50km in length at peak holiday times, but apart from those periods, the roads should be plain sailing, or driving. Driving down some of the major highways you get a different view of Japan than that you see by train. There are some beautiful mountain ranges and as the sun sets the sun falls behind the trees showing many shades of green. I took a drive recently and managed to snap the sun setting on this stretch of road. It was one of the rare occasions I felt the need to use the screen on the back of the camera to take the photo instead of peering through the viewfinder lens. Considering I was traveling at about 120kmh, I think the shot turned out fairly well. 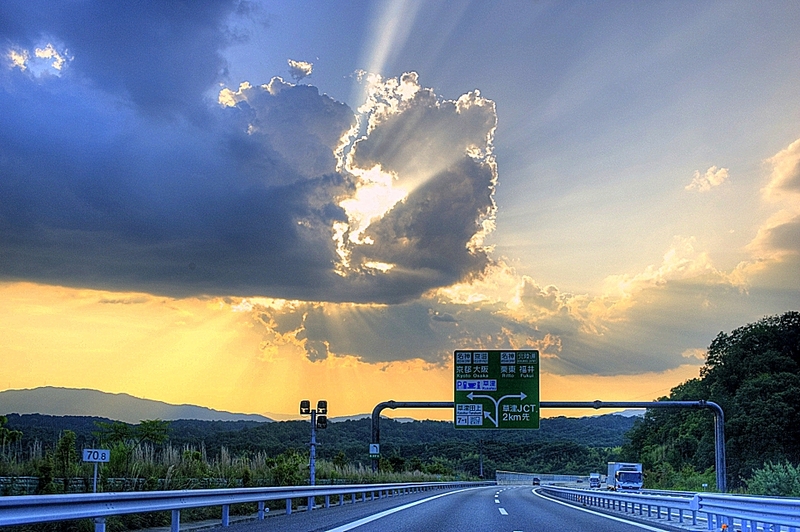 Have you driven anywhere in Japan? I drive every day in Japan and about once a week on the highway. Japanese drivers are crazy! Red light? Why should I stop? Another car is coming? Why should I wait? It’s really crazy and you have to be very careful when driving!